Microsoft has officially announced the successor of Surface Hub which was launched back in 2016. Called Surface Hub 2, the device will come with a 50.5-inch display and 3:2 aspect ratio. With the new Surface Hub, Microsoft plans to redefine the boring conference room meetings. 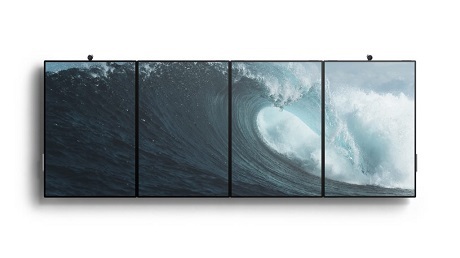 You can check out the official video of the Surface Hub 2 below. The Surface Hub 2 will come with 50.5-inch display and 3:2 Aspect Ratio. The device will also support 4K resolution. Microsoft also made sure to cut on bezels so Surface Hub 2 has a better screen-to-body ratio. Microsoft has also added the same muscle wire technology into the Surface Hub 2 so it can seamlessly change orientation from portrait to landscape and vice-versa. The company has also added 4K cameras that rotate with the device, integrated speakers, and far-field mic arrays. Microsoft has also promised better software support with the new Surface Hub 2. The device will be based on Windows 10 and will take advantage of Windows Hello to allow users to easily login and start working. Apart from this, Microsoft has also optimized the software for productivity apps like Microsoft Teams, Microsoft Whiteboard, and Office 365. 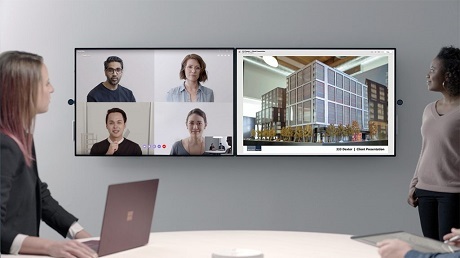 Microsoft will also allow users to connect multiple monitors and use all of them as one screen. This will also allow users to share and work on different apps side-by-side. Coming to Windows Hello, Microsoft will allow multiple user accounts to be created and users can use biometrics to access their account and start from where they left off. Microsoft hasn’t shared the exact specs or the release date but has promised its availability in 2019. With the introduction of Surface Hub 2, Microsoft is also partnering with Steelcase to create a system of rolling stands and easy-to-use mounts. With the Surface Hub 2, Microsoft surely has taken up the responsibility to reinvent how people use technology to get work done.